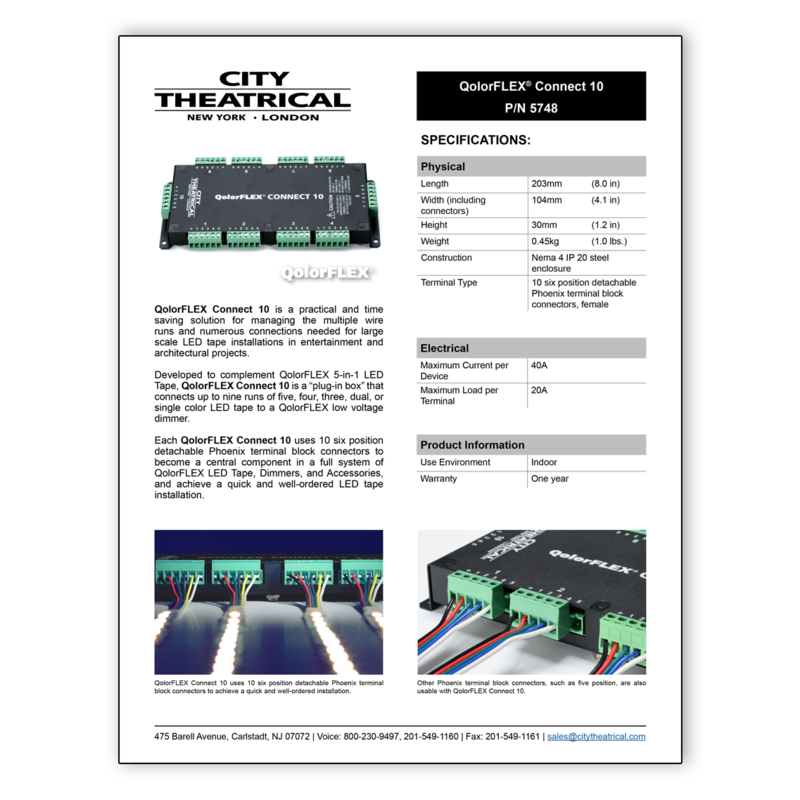 QolorFLEX Connect 10 is a practical and time saving solution for managing the multiple wire runs and numerous connections needed for large scale installations of LED Tape in entertainment and architectural projects. Developed to complement QolorFLEX 5-in-1 LED Tape, QolorFLEX Connect 10 is a “plug-in box” that can connect up to nine runs of five, four, three, dual, or single color LED tape to a low voltage dimmer. 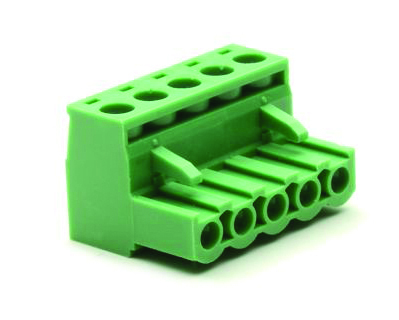 Each QolorFLEX Connect 10 uses 10 six position detachable Phoenix terminal block connectors to achieve a quick and well-ordered installation. QolorFLEX Connect 10 is a central component to a full system of QolorFLEX LED Tape and Dimmers. It connects QolorFLEX LED Tape, including 5-in-1 and Quad Chip LED tapes, and QolorFLEX LED Tape Accessories, including 18-gauge five and six conductor ribbon cables and five and six position Phoenix terminal block connectors, to a wide variety of QolorFLEX Dimmers, like the QolorFLEX 5x8A Dimmer, and LED Power Supplies. QolorFLEX Connect 10 is constructed with a Nema 4 IP 20 steel enclosure, and offers a maximum current per device of 40A and maximum load per terminal of 20A. This technology was developed to overcome the challenges faced by lighting professionals doing large LED tape installations. QolorFLEX Connect 10 makes the setup process faster, is useful for sets that require assembly multiple times, such as touring productions.